Over Under Bet Explained - Total Bet Tutorial - What is a Total Bet? Watch our Total Bet Video below! Complete over under bet overview. This bet is easy to learn. Winning bettors can make substantial profits. Next, you’ll learn how they work, pros and cons, tips and bets to try yourself. Sportsbook estimates a combined point total. Players bet whether final result will be over or under this number. Total lines can be offered for Game or 1st half. Final point total includes overtime result. Review sportsbook’s estimated point total. Decide if result will be over or under. Sportsbook Juice follows o or u. O is for over. U is for under. Assume -110 juice where no number specified. A result equal to the sportsbook’s prediction produces a tie bet. ½ totals – Major sports tally points using whole numbers. 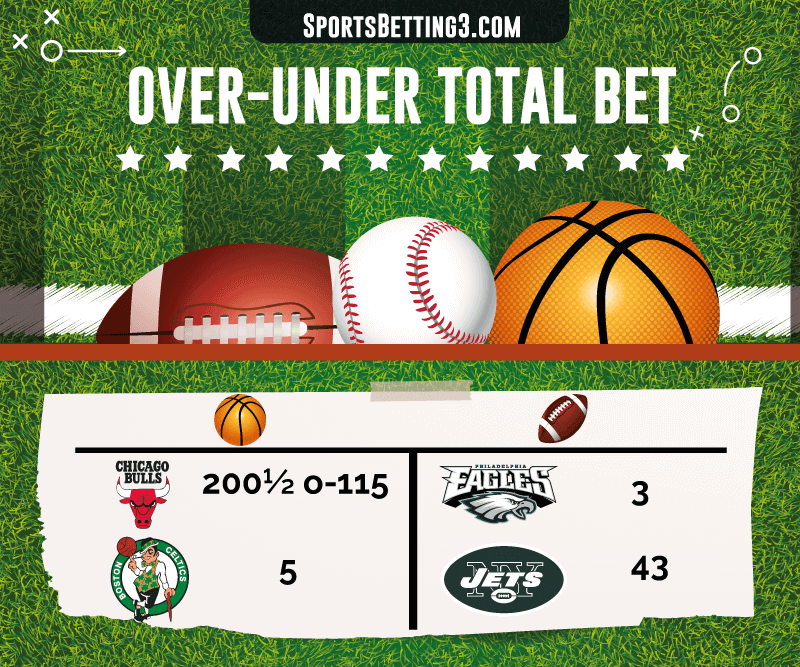 Lines with ½ increments mean the final result will be over or under the sportsbook’s estimate. All bets will either win or lose. No bets can tie a ½ point total line. Common straight bet. Can be combined into parlays, if bets or reverses. Teaser bets allow adjustments to over or under values. Sportsbook predicts 43 point total for Philadelphia vs. New York. Assume -110 for Totals without over or under juice specified. Over Bet. Player risks $110 to win $100 that point total will be over 43. Under Bet. Player risks $110 to win $100 that point total will be under 43. Player wins Over Bet if result is 44 or more. Bet loses if total is 42 or less. Player wins Under Bet if result is 43 or less. Bet loses if total is 44 or more. Total bet ties if result is exactly 43. Bet will be refunded. Easy to learn. Only two outcomes are possible. Different lines can be offered for same market. Multiple total bets can be combined into parlays, if bets and reverses. Initial sportsbook prediction subject to change. Oddsmakers want balanced action. Overtime counts towards final result when wagers are graded. Consider probability of regulation ties into your handicapping. Carefully compare sportsbook juice to maximize profit. Values may vary across multiple sportsbooks. Know common NFL totals. See Key Numbers Table below. Bet over games with low point totals <= 37. Bet under games with high point totals >= 51. Caution: many other factors could warrant unusually high or low totals. See this page for more NFL total data. Totals may vary between sportsbooks as each book is rebalancing its action. Find inconsistent total lines with point spread and total comparison calculation. See steps below. Shop sportsbooks for inconsistencies. Bet over a lower number and under a higher number. Review each team’s scoring trends. Results from the last 10-15 matchups are helpful when assessing a line. Do not rely on last week’s results or season averages. Averages can include atypical results. They do not reflect the likelihood a team will score a certain amount of points. Shop sportsbook total lines. Identify opportunities as sportsbooks rebalance action. Compare juice on similar lines. Some sportsbooks will offer less juice on the same line. Parlay Total Bets – Combine multiple totals into one parlay. Each prediction must be correct for the parlay to win. Parlay payout rules apply. Baseball Under Bet – Look for games with high run totals. Take the under. A keen eye for bad lines combined with basic handicapping skills are required. College Basketball 1st Half Correlated Parlay – Look for large spread to small total ratios. Example: 25% Correlation means 15 point spread to 60 point total (15/60 = 0.25). Bet 2 first half parlays: 1) Favorite and Over, 2) Underdog and Under. These are rare occurrences. Many sportsbooks prohibit correlated parlay betting. Football Correlated Parlays are rare, read why here. Grand Salami – Baseball Prop bet on total runs scored in all games on a given day. This wager can be risky. The over under bet was likely invented in the United Kingdom during the 19th century. It became popular as sports suitable to total betting became common: soccer, football, basketball, baseball, hockey and cricket. Points Per Game each team, last 10-20 games. Previous meeting results and stats. This total is consistent with the sportsbook’s spread. If projected total was under sportsbook’s total, bet under. If projected total was over sportsbook’s total, bet over. Review other sportsbooks’ lines. For example, bet over if another sportsbook’s total is <205. These changes can be profitable betting opportunities. An over under bet is against the bookmaker not the game. – sign for opposite juice.